Producing Hit Records: Secrets from the Studio by David John Farinella is an inside look at what producers do in the studio to help create the soundtrack of our lives. Fewer jobs in the world are harder to explain than "record producer." It's a job that's all encompassing and ill defined. Are they songwriters, musicians, engineers, accountants? Are they friends, cheerleaders, drill sergeants, therapists? The short answer is yes. The longer answer is at all times a record producer must balance all of the above and so much more. 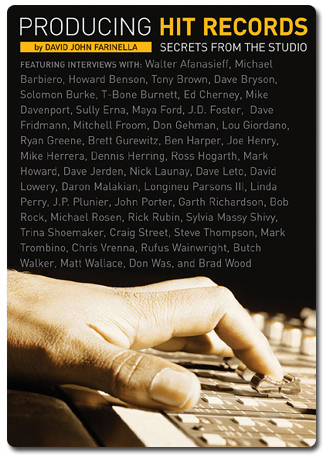 The art of record production can seem like sonic voodoo to a casual fan, but the producers featured in this book know the ins and outs, the secrets and the tricks to running a successful recording session. The producers included here run the gamut of experience, from Platinum-selling and chart-topping releases, to indie cult favorites, to artists taking their first spin in the big chair. In candid, often brutally honest moments, each producer shares what it took to get into the business, how they continue to stay busy, how they work with songwriters and musicians, how they manage a budget, and how a session comes together once all the pieces are in place. The goal of this book is not to enable a reader to be able to walk into any recording studio and produce a major-label release. Rather, this book is for anyone who is curious about what happens inside the studio when producer and artist get to work.